Co-produced by Intima and Cona, Ljubljana. Secretly performed in the kitchen of La Scala in Milan, Italy. Ballettikka Internettikka is a series of tactical art projects by Igor Štromajer and Brane Zorman which began in 2001 with the exploration of Internet ballet. After invading the Bolshoi Theatre in Moscow (March 2002), Štromajer and Zorman performed a new guerrilla ballet invasion, this time of another famous theatre (ballet and opera) house in Europe - Teatro alla Scala in Milan, Italy. They entered the kitchen of the famous Teatro alla Scala, where bio-food for artists is prepared. In 2004, the kitchen of the Teatro alla Scala is an excellent example of a modern cooking laboratory for healthy food - automatized and meeting the highest hygienic standards. 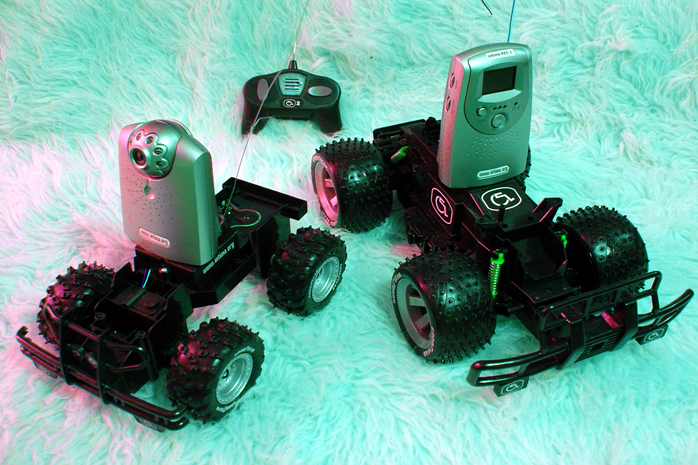 The artists used two remote-controlled toy-robots with two wireless web cameras. Robots and cameras (algorithm of the ballet choreography and MP3 orchestra) were remotely controlled from a mini-van parked at the north-east side of the Piazza della Scala in front of the Teatro alla Scala. This time, Stromajer and Zorman (as ballet dancer and musician) were replaced by robots, lonely and sad icons, automatized units, which had no major problem to invade the kitchen of the famous Teatro alla Scala and dance the net-ballet there. Toys transform into guerrilla-ballet dancers. Stromajer and Zorman approached the Teatro alla Scala full of respect towards its rich history, especially La Divina Maria Callas [www.callas.it]. 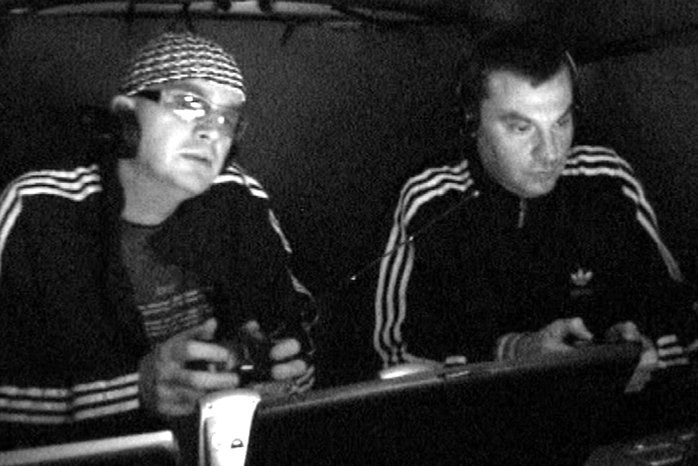 They used hi-tech mobile and wireless equipment for the invasion and live broadcast (portable computers, mini digital camera, MP3 audio systems, mobile WAP telephones etc). A laptop and MiniDV cam, together with Webcam32 (version 6.0) software was used for broadcasting the video signal (running over Intima Virtual Base FTP server). Another laptop and MP3 player with online interface SHOUTcast (version 1.8.3/win32), was used for live sound broadcasting (running over Beitthron FTP server). Two local GSM mobile phone operators (TIM - Telecom Italia Mobile GSM 900/1800 and MOBITEL - SI GSM) were used for GPRS mobile internet connection. Performing an illegal wireless roboballet in the kitchen of the Teatro alla Scala represented a big conceptual and strategic challenge, therefore the preparations were taken seriously, safety measures were calculated, and the previous experience from the Bolshoi Theatre in Moscow were very welcome. NOTE: In November 2004, Teatro alla Scala was temporarily closed for the public due to restoration works, therefore all the performances took place at the Teatro degli Arcimboldi. On 13 November 2004 at 8 pm, La Scala ballet ensemble performed The Swan Lake by Peter Ilyich Tchaikovsky (choreography by Vladimir Bourmeister) on the main stage of the Teatro degli Arcimboldi in Milan. Project was financially and technically supported by The Ministry of Culture of the Republic of Slovenia; MojNet d.o.o. Ljubljana; CICV Pierre Schaeffer, France. Special thanks to Irena Pivka, Tanja Lažetić, Dejan Habicht and Bojan Golčar - Radio MARŠ. "We shall fight them on the beaches. We shall fight them on the landing grounds. We shall fight in the fields and in the streets, we shall fight in the hills. We shall never surrender."